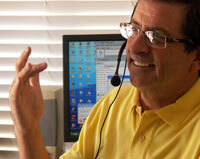 Use this great training tool to sample your telephone sales and get the entire staff producing more money. It's crucial to increasing sales success: knowing how your staff talks to potential customers. Are they building rapport? Are they explaining benefits? Our team of mystery shoppers will make and record calls to your organization and e-mail them for your review. We can use your scenarios or ours. We can send a simple recording for you to evaluate or add a written assessment and provide telephone or Webinar coaching. Here's a sample hotel reservation mystery shopping call in MP3 format, playable on QuickTime or Windows Media Player. How would you rate this fictional call? What would you say to your phone sales person about this call? Contact us to discuss a customized mystery shopping program.